Kissimmee Florida, just outside of Orlando, is an old Florida kinda place. No large tourist crowds and no theme parks, just a clean, busy downtown with lots of charm and art in public places. Located in this historic downtown Kissimmee is Joanie’s Diner, an old style home-cooking kinda place. Joanie’s is now run by the two daughters of namesake Joanie. And they are keeping tradition alive by serving classic comfort foods for breakfast, lunch and dinner. The town’s old timers spend their mornings here, and I bet many residents stop in frequently. Joanie’s is the place where everyone knows your name- and probably who your parents are and the wild stories from your youth! Tastes Like Travel stopped in one morning for brunch, and sat in a booth across from the picture windows giving a great view of the street for people-watching. We ordered the mushroom swiss cheeseburger and the club sandwich. While we waited I chatted up one daughter, our waitress, who gave me a tour of the pieces of local history hanging on the walls near our booth. Kissimmee is part of old central Florida history that goes back to native Americans. Lots to discover! When our orders arrived we were pleasantly surprised at the size of the portions. They were normal sized! The club was made on regular size bread and the hamburger was about a 2-3 ounce portion on a 4 inch bun. What most now consider ‘small’ but which are really normal portion sizes. 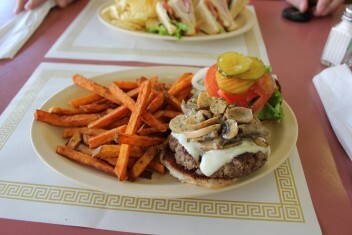 The Club came with classic potato chips and in a nod to healthier food choices the burger came with sweet potato fries. Everything was cooked as we had ordered, they are not afraid of a medium-rare burger order. We ate everything and it was just the right amount to tide us over until our next meal without feeling stuffed. And the best part is that the prices reflected the size of the portions. A very good deal! On your way to see the Hoover Dam? Hungry? 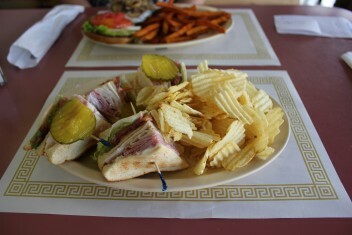 Then go off the beaten path and check out the Southwest Diner in Boulder City Nevada, a cure for fast food. You’ll find excellent home cooked food with good service in a funky, fun ambiance. The country décor with antiques (Look for the old hand-crank washing machine in the corner) was well done, not too much stuff. And our drinks came in Mason jars, fun! 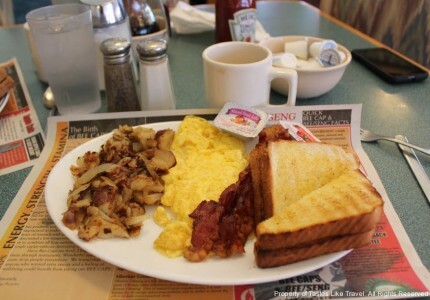 It doesn’t matter what time you show up, the Southwest Diner is open for breakfast, lunch and dinner. Great Southwest Breakfasts and Omelets include ‘Those Potatos’ – pan-fried with onion and bell pepper – and a choice of homemade banana nut bread. 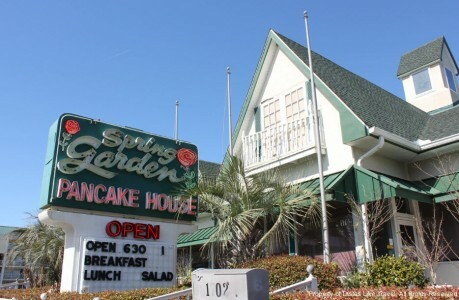 Their breakfast specialties include Santa Fe Potato Pancakes and Chile Relleno Breakfast. We arrived in time for a late lunch, and as we were starving (first meal of the day – hey, we were in Las Vegas!) we ordered dinner. With our fresh salads we tried their homemade chili. It was a good bowl of red with beans, not too spicy, and served in a mason jar as well. Then came the main courses. 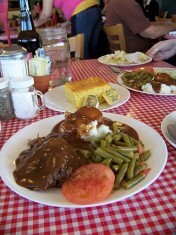 The Homemade Pot Roast looked like grandma made it. It was fork tender and delicious. The Santa Fe Chicken Breast was topped with sautéed onions, bell peppers, green chilies and mushrooms, with Jack cheese melted over all. The chicken was moist and tender. Very good! Both meals came with soup or salad, mashed potatos with brown gravy or fries, and a basket of fresh made breads. The huge pieces of corn bread were excellent, sweet, warm and crumbly – Yum! And although the dish of ice cream was a small one, it was a perfect bite of sweetness to end the meal. With a selection of sandwiches, burgers, hot dogs, salads, shakes, malts, and homemade desserts, plus a daily selection from the blackboard menu, the Southwest Diner has something for everyone, at prices that will please the person paying! So get off the main road and try a little local taste –you’ll love it!